This beautifully illustrated 142-page monograph is the definitive document of American artist Susan Weil’s large and diverse body of work to date, including her livres d’artistes and selections of her poetry. The color plates are arranged by decade, with an emphasis on her work of the last twenty years. 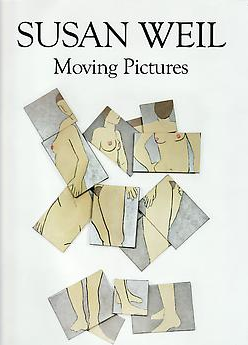 The images are accompanied by scholarly essays on her life and art by Dore Ashton, Olle Granath, and David Weir. In a career spanning more than sixty years, Susan Weil has forged a singular path. She came of age as an artist in the postwar period studying under Josef Albers at Black Mountain College alongside Willem and Elaine de Kooning, Jasper Johns, Robert Rauschenberg, and Cy Twombly. Although she has deep roots in the New York School of Art, her work defies easy categorization. She fractures the picture plane, deconstructing and reconstructing images. Fascinated by sequential movements in time, she sets images in motion using canvas, paper, Plexiglas, and aluminum, to name just a few of her mediums, in unconventional ways. Weil embraces serious and playful elements in her work, and unlike her contemporaries, she has never been afraid to pursue figuration and reference reality, unabashedly drawing inspiration from nature, literature, photography, and her personal history. Weil has been a quiet maverick among her postwar peers, but her work speaks loudly and clearly, affirming her place in the history of modern art as a unique and innovative figure.